We were ecstatic yesterday to watch Kai Ogden (second from right) win a bronze in the English National Championships in Sheffield. Madison has been training with Kai since she was very small and apart from going to LACPP for a while and Kai changing to Hackney Aquatics earlier, when Madison still remained in Bethnal Green Sharks, they have spent almost their whole swimming careers within sight of each other, or within the same club. Kai always struck as being Born to Swim, his dedication was always such an encouragement to us all. I am pleased to say that Madison’s shoulder is now getting better, the exercises help and now she can at least stretch both her arms out again to do a proper starting jump and begin to do the arm strokes again. It should be fine by Sunday, when we go to Melanie Marshall’s Swim inspirations camp. But Madison is itching to join her fellow swimmers next season to make the podium on the premium events. 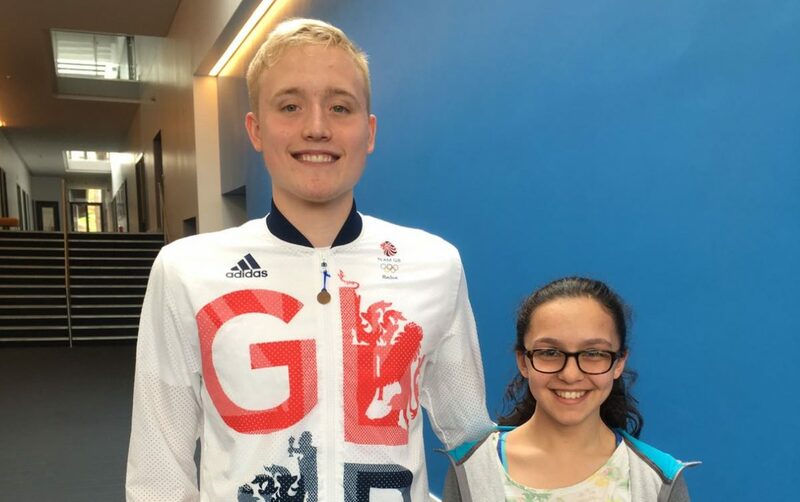 Even her friends who went to Welsh Nationals achieved very good placings in finals so far and Madison closely follows her long-standing training partner Kaia Cudmore on her success. Somehow what Madison lost on training through injury before the end of the season will be made up through the mid-season swim camp. It is all working out fine but Madison really wanted to be part of the action, which is definitely going to happen next season. We gotten our new training plan, and it provides the much-needed gym sessions, three sessions per week at the London Aquatic Centre. Most of Madison’s former friends from the LACPP, which was then taken over by Newham, have now also joined Hackney Aquatics. HAC is the club to be for us East Londoners. Just hate it when my club shuts down for the whole of the summer holidays, so I do not get 5 weeks worth of training. This year I am attending the summer camp, (early August), last year I attended the Easter camp. Apparently Repton was an invasion point for the Vikings around 865 AD, how amazing. The swim camp is going to be at Repton school in the wonderful Derbyshire countryside. I know I am not going to make it for the English or the British Nationals this year and so opt for some concentrated training with Grant Turner instead. Last year I gotten a lot of swim inspirations there. So why do I swim? I suppose now I am doing it for fitness and stress relief. I think I’ll also want to be a coach later on. I am going to study sport science, triple science, maths and continue to do the intensive training. My brain works best with lots of swimming. Hopefully next year I’ll get better still and will make the nationals. Incidentally the polite attentiveness of both Grant Turner and Melanie Marshall is characteristic of fast and happy swimmers. Posted on May 17, 2018 May 18, 2018 by Dedicated IndividualPosted in British champs, club, land training, Regionals, Swim camps, Swim England Summer Games, swimming, trainingTagged 2018, Repton, Swiminspiration. Swimming must be the Best sport, looking at those pics, the week in Spain is at the half-way mark and swimmers are having a wonderful time training in the sunny pool of Torremolinos Sports Abroad. The first Olympic swimming took place in 1896 in the Bay of Zea but was only available for women since 1912 in Stockholm Sweden. Now we do start to recognise that swimming has a beneficial effect on health for all ages and school children learn better when swimming. There are now many swimming competitions held all year round and our next big event will be the London Regional Championships held at the London Aquatics Centre and Crystal Palace. The swim camp in Torremolinos is an extra special Easter break treat and prepares nicely for the competitions ahead, culminating in the British Summer champs, European Champs. Posted on April 11, 2018 by Dedicated IndividualPosted in British champs, British Swimming, Competition, health, Junior Championships, London Swimming, long-course (50m), Nationals, Olympic Games, Regionals, Swim camps, Swim England Summer Games, swimming, trainingTagged 2018, Torremolinos.